With the invention of the upright piano in the 19th century, more people were able to play concerts at home to entertain family and friends. 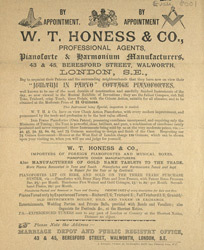 The harmonium is reputed to have been invented in 1842 by the Frenchman, Alenandre Debain. By the end of the 19th century it was a sophisticated instrument with two foot pedals and knee pads to control volume. Harmoniums were also popular in churches that could not afford to buy organs.